This contest has been marked as a duplicate of == Win $1,000 in Visa Gift Cards + a $400 Hotel Voucher! ==. 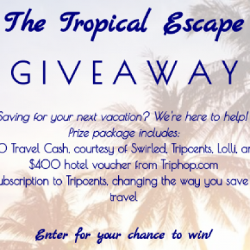 Prize: $100 Visa gift card from Tag The Flag, $200 Visa gift card from Tripcents, $200 Visa gift card from Swirled, One (1) $500 Visa gift card from Lolli, travel voucher from Triphop ($400 value), two-month subscription to Tripcents.